Privacy awaits you! This large modern home is built on beautiful private land with its own seasonal creek. Near Yosemite and Bass Lake. This exceptional custom home is tastefully furnished and decorated. 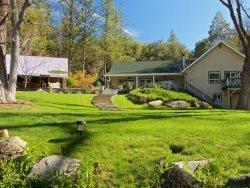 It has 2745 square feet of living space built on 3.5 acres of land near Yosemite National Park and Bass Lake in the middle of lush greenery, tall trees, and wild life. The home features lovely views from every window, a seasonal creek, and a relaxing gazebo. Enjoy a well-furnished kitchen with propane stove, lovely rock fireplace in the family room, and vaulted ceilings. A large deck off the back of the home has a barbeque grill, dining table, and a swing. The home has a large living room, a family room, a 6-seat dining room, and a 4-seat dining nook off the kitchen. There is a large master bedroom with a king size bed and a private large bathroom with shower and jetted tub. Two additional bedrooms have queen beds and a large loft is beautifully furnished with 4 single beds. The home is located about 16 miles from the south entrance to the Yosemite National Park. Other nearby attractions include; - Bass Lake Water Sports - 12 miles - Yosemite Mountain Sugar Pine Railroad – 6 miles - Chukchansi Casino – 11 miles - Zip Line Rides – 13 miles - Oakhurst downtown – 3 miles that fulfills all your needs including restaurants and Starbucks.